Gupta Empire Artifacts: The Gupta Empire was named after the Gupta dynasty which ruled approximately between 320- 550 CE. The Gupta dynasty period is regarded as the Golden Age of India. The Gupta Empire artifacts include the sculptures, paintings, architecture, and pottery. The sculptures of the Gupta Empire showcase the skills of the people belonging to this period. During the Gupta rule, the style of sculptures that developed was entirely Indian since the influence of foreign arts had slowly vanished. The sculptures made during this period had religious and spiritual themes attached to them. The sculptures mainly paid attention to themes like the Buddha, or Hindu gods like Shiva and Vishnu. 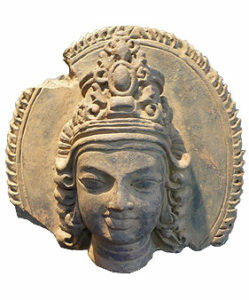 It was during the Gupta dynasty period that the Buddhist sculptural work prospered. More attention was given to the poses and gesture of the figures. The two important illustrations of the Buddhist sculptural work that progressed during this period were the Standing Buddha of Mathura and the Sitting Buddha of Sarnath. The Standing Buddha was built using red sandstone in the 5th century. The sculptures of the Gupta period proved to be a source of inspiration to arts and also to the later dynasties which established here. During the 5th century snakes comprised of an important part of the sculptures. In the Gupta Empire period, the art of Bharhut, Amravati, Sanchi, and Mathura amalgamated into one. The composition which was created by the union of these arts gave importance to the feminine figures. The turning point of the Gupta Empire sculpture was the use of the human figure to indicate an image. Terracotta was very popular during the Gupta reign. The Ajanta caves in Maharashtra are good examples of the craftsmanship of the Gupta people. Some parts of Madhya Pradesh were the Gupta rulers had established their kingdom is also very popular for its sculptural works. During the Gupta Empire period, approximately between 4th and 6th century AD, pink sandstone was used to make sculptures in Mathura. These sculptures were extremely delicate and had a very high fineness. The Gupta Empire art not only influenced its Indian counterparts but also provided inspiration to other countries in the East Asian region. The Gupta Empire was popular for its paintings. In fact, it was during the Gupta period that progress was made in the field of art. The paintings of this era were of a secular nature. The paintings in the cave of Ajanta in the state of Maharashtra and the paintings in the cave of Bagh in the state of Madhya Pradesh symbolize the Gupta style painting. 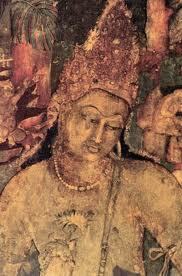 The cave paintings of the Gupta period commonly showcased the life of Buddha and various stories from the Jataka tales. As such, there was some religious aspect attached to the painting style of the Gupta period. During the Gupta Empire period, proper attention was given to the detailed architectural work of the temples. The temples belonging to this period are a good illustration of the craftsmanship of the people. However, only a few of these Gupta architectural structures have survived the test of time. The pillars and the roofs of the temples were specially ornamented. During the Gupta period materials like brick or wood were used to build the temples. The Gupta people slowly started using stone for building temples. Apart from the temple architecture, the cave architecture of this period is also very well- known. 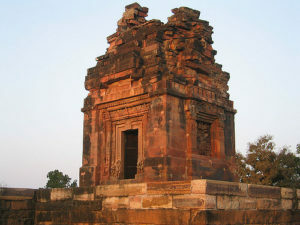 The Dhameka Stupa is a fine example of the Gupta architecture. The Buddhist art also prospered during the Gupta Empire period. The pottery works of the Gupta Empire period were made using materials like ornamented bricks, tiles and vessels.